Long-time volunteer and friend-of-the-arboretum, John Neorr, created a beautiful album of pictures that he took during a walk in the arboretum in late January. Check out this album and note his wonderful captions as he guides you on his journey. 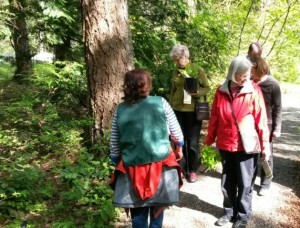 Because of the dedication of our tireless volunteers, our ever-expanding partnerships and community outreach efforts, we are finding that our 42-acre Arboretum is becoming a desirable destination and a vital regional resource for a diverse group of visitors from the Puget Sound region and beyond. We hope that you, your family and friends can make a visit to the Arboretum at least once each season, whether you stroll along level gravel paths around our display gardens and collections, hike our rustic forest trails or participate in one of our educational programs, like a docent tour. From April to October, free guided walks leave from the Arboretum Gazebo at 10:00 a.m. on the third Saturday of each month, led by volunteers called docents. 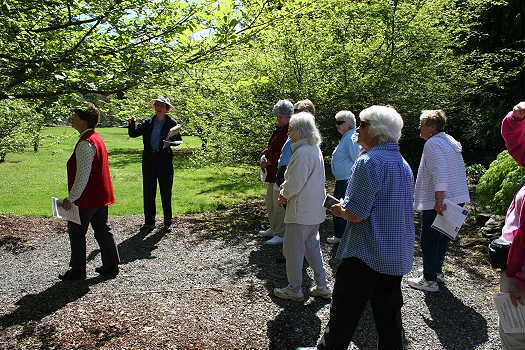 Docents are trained by Master Gardener volunteers and Arboretum staff on the details and history of every garden, collection, forest reserve and feature of the Arboretum. Upon request, docents can also plan group tours on specific dates or cater a tour to special interests. Group tours on special days can also be arranged by emailing tours@lakewildernessarboretum.org. Docent volunteers can also help arrange parking for bus tours and recommend local restaurants, etc. to make the afternoon a truly memorable experience. The Lake Wilderness Arboretum Foundation is always looking for new volunteers who would like to help with our docent programs. The time commitment is approximately four to eight hours per month from January through October. For more information on our docent program or Lake Wilderness Arboretum, please contact the Arboretum at info@lakewildernessarboretum.